Violin plots are essentially pretty versions of box plots, where the width is set by the local density. For skewed distributions, you get things that look a bit like “violins”, hence the name. Though the termplot() function fails with plotting just one covariate and leaves no cusomization. In order to use the function you have to “source” it into R. It is the same procedure as calling a package, but using “source” instead of “library”. I rewrote the “rugs” option. Try rugs = "density" It is still “beta”ish, but some like it. V0.4 – the y-scale should be logarithmic; a HR of 0.5 (50% reduced Hazard) should show the same distance from HR = 1 as a doubled Hazard (HR = 2); this is now default. The linear scale I used initially is biased in this concern (Hat-tip: Arve Ulvik, Eva Pedersen and Roy Nilsen). 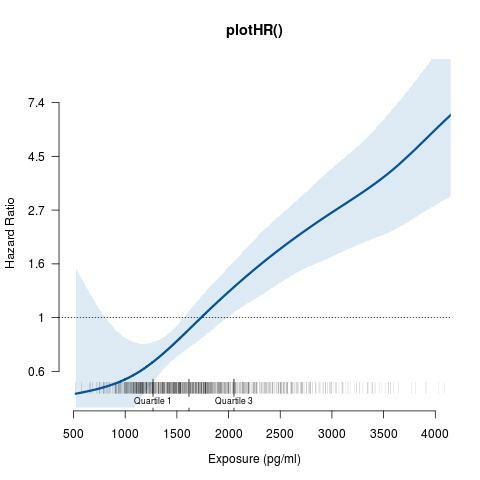 The option y.log allows both ways (linear and log-scale); the axis labels denote Hazard Ratio instead of log(HR). rug – “ticks” or “density”; rug plot or density plot at x-axis. Any other value for “rug” will omit the rugplot. R can do all kinds of matrix calculations, like multiplication, tranposing and calculating the inverse. The following manual was created by Phil Ender. Note: R wants the data to be entered by columns starting with column one.